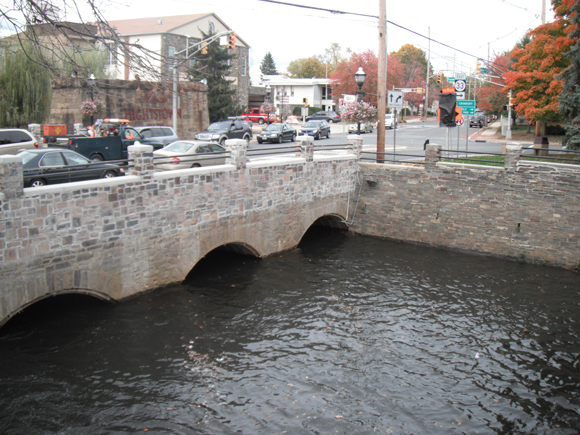 New Jersey Department of Transportation helped citizens of a town hit by Hurricane Irene get back to their normal routine with the quick and innovative repairs of a historic bridge. When Hurricane Irene hit the northeast in August 2011, the storm damaged transportation infrastructure such as the historic Route 33 Bridge over Rocky Brook in Hightstown, N.J. NJDOT quickly sprang into action in order to restore vehicular and pedestrian traffic as soon as possible, safely and cost effectively, as the bridge was a vital link that supported motorists and local businesses alike. NJDOT teamed up with the Louis Berger Group to come up with a sustainable approach in including new but historically appropriate bridge parapets, railings and sidewalks for the project. NJDOT and LBG worked in close coordination with local officials and organizations to keep the project moving while also avoiding major disruption to the traveling public. The project, which typically takes a year, was completed in 8 weeks (many months ahead of schedule) and under budget, which allowed Hightstown businesses and citizens to get back to their normal lives quickly after the storm.